Who are the Best Removalists in Melbourne? Being the best removalists in Melbourne means treating each and every removal with the highest level of efficiency, professionalism and care. Dawson Moving & Storage operate throughout Melbourne, Canberra and nationwide with the ethos of upholding their excellent reputation for successful, stress-free moves. Local or interstate, Dawson Moving & Storage are the best removalists to trust with your furniture and precious goods. Striving for a Better Best! The team at Dawson Moving & Storage don’t rest on their laurels, in fact, the movers are always refreshing and enhancing their removalist skills with training and industry experience. A close affiliation with AFRA (Australia Furniture Removal Association) allows the Dawson Moving & Storage team access to up-to-date industry news, health and safety information and policy guidelines. This means that choosing Dawson Moving & Storage for your upcoming move will set you up for a truly expert, hassle-free Melbourne move. Before, During and After Care. The best moving experience is a well-rounded one. From the first contact with Dawson Moving & Storage, you will be in the best hands. Their online or over-the-phone quoting is simple and extremely precise, leaving no room for unexpected costs on moving day. The customer care team will offer relevant advice leading up to your Melbourne move, and will alleviate any anxieties you have. Come the big day, your removalist team will be reliable, efficient and expert at loading and unloading your furniture and goods with precision. Once the process is complete, you can enjoy the beginning of your new chapter. If your move requires short or long-term storage or other ancillary services, all will be arranged with ease. Follow up is important to the Dawson Moving & Storage team, and they will always be in touch to ensure your satisfaction. The Masters of Moving in Melbourne. Dawson Moving & Storage began their service in Melbourne over 40 years ago. Since then, they have expanded their premium removalist business nationwide, pleasing thousands of Australians with quality transportation and storage services. No one knows the streets, patterns and properties of Melbourne better than Dawson Moving & Storage. With a local head office and plenty of Melbourne storage facilities, you are guaranteed a smooth Melbourne move by choosing the masters of moving in Melbourne. 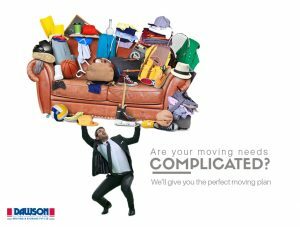 For the best removalists in Melbourne who are also specialised furniture removalists, you can reach out to Dawson Moving & Storage, the established Melbourne movers.